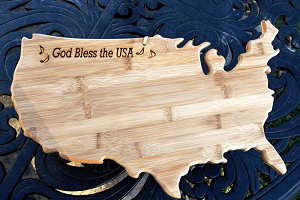 Make the USA part of your home by using (or hanging) this bamboo cutting board in the shape of the continental USA. Easy to clean and maintain. Can be personalized. 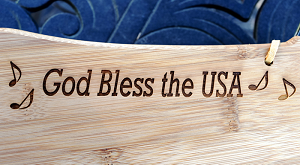 Some captions to consider: "God Bless the USA", "This Land is Your Land, This Land is My Land", "From Sea to Shining Sea", or even your family name. 11" x 16" x 1.5"